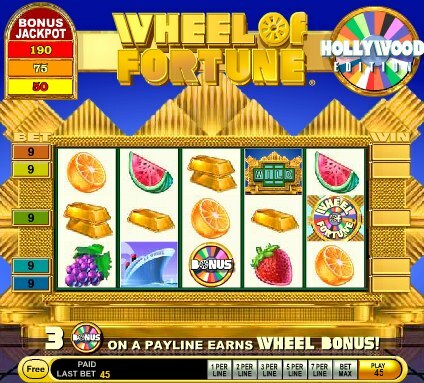 Wheel of Fortune: Hollywood Edition is online casino slot game developer IGT’s effort at recreating the drama and the excitement of the legendary daytime television quiz show Wheel of Fortune with a twist. This is a 5 reel, 5 payline slot that will bring the feeling of nostalgia to the fore and have you reminiscing about a day gone by when you were sitting down in front of the TV and willing the contestants on to win big prizes when they spun the wheel. The one difference is that now you’re the contestant and you could win the prizes. The max payout is 50,000 coins per line bet so you had better be ready for some intense slot action! 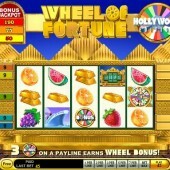 Wheel of Fortune: Hollywood Edition is all about the main bonus feature called the Wheel Bonus Feature. This is where the slot action moves onto another level and also merges with the aspects that made the quiz show such a hit. The bonus feature is triggered when you hit three Wheel Bonus scatter symbols in succession on an active pay-line. These symbols only appear on reels 1, 2 and 3. Once you are in the Wheel Bonus Feature you must press the Spin button to set the wheel turning. You must then decide whether you take your winnings after each spin or risk hitting the Bankrupt slices on the wheel and losing it all by taking another spin to try and win more prizes. The Wild multiplier symbol in Wheel of Fortune: Hollywood Edition is represented by the Wheel of Fortune Board. It substitutes for all other symbols except for the scatter symbols to complete winning combinations. It is also worth noting that the Wheel of Fortune Board Wild multiplier symbol doubles the payout of any winning combination it completes. Interestingly, there is also a Bonus Jackpot Symbol that gives players an extra chance of winning. There are three Bonus Jackpot Accumulators displayed in the top left corner of the screen with each one displaying a bonus value. When a Bonus Jackpot Symbol appears on the reels then the number of coins shown on the symbol will be added to the accumulator. The total amount accumulated is then available for you to try and win in the Wheel Bonus Feature. Wheel of Fortune: Hollywood Edition is not necessarily one of IGT’s flagship slots in the vein of the Egyptian themed Cleopatra or the dazzling Da Vinci Diamonds but it is certainly a slot that will generate a fan base. Wheel of Fortune is one of the most iconic quiz shows of all time and it just seems right that it has a slot game worthy of its prowess.